I really need to start getting to bed earlier. But the lure of Operation Repo and Pranked is just to tempting. 3 miles this morning. 1 mile warm up, 1 mile fast (for me), 1 mile cool down. I gave the customary high five to Mexican Liberty. As I was running by the canal I saw a duck. I thought how cool it would be if the ducks that have been frequenting our front yard were there when I finished my run. Just as I finished as if on cue, they touched down in my lawn. I sat down and watched them for a few minutes. There was some stale bread left over from the last time my kids fed them that I threw to them. Group run up at Las Sendas. Las Sendas is kind of a ritzy area. Very nice houses. Gated communites. Desert preservation. Tonight I saw a couple of cop cars driving around. I wondered what they were doing. Then we ran passed a guy walking his little pooch. Shortly after that I heard a noise in the bushes up by a wall. I glanced over and saw a large shadow. I was going to keep running, but I remebered the police cars. So I stopped and went back. There were two javelinas. Up until last year I'd never seen any in the wild. It was pretty cool, but they are mean. I hope they didn't eat the little pooch. 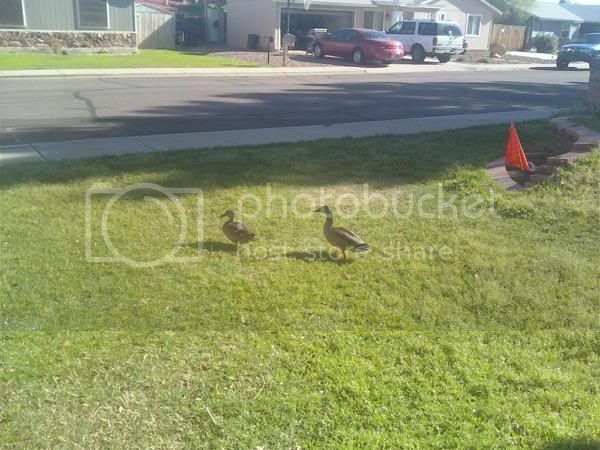 i didn't know you had ducks in arizona. i didn't know you had lawn in arizona. oh, and i forgot about your easy-speed-easy sandwich. good job. you'll get a great job when it's a double-decker. allie - I puke every time I see that show. Asston Kutcher. Hurrrrl!!! But yes, we do have lawns and ducks. I added a picture to prove it. looks like you have cars, too! my computer censored the third and tenth word in your comment. i am assuming it said "laugh" and "ashton-bright-eyes"
That is a nice speed sandwich, good run. boy crush on Ashton, burt are you wearing your sensitive man sweater? 3 little ducks went out to play, but when the mommy duck said QUACK QUACK QUACK well you know the rest. You must be the duck whisperer Burt. allie - of course we have cars. It's not like the covered wagons you guys use in Utah. I guess my last comment took so long to type that I had two other people comment while I was typing it. Rhett - It's not so much what you say, it's how you say it. Flat - You're right. 6:43 is slow for me. Maybe you should consider a career change. Those scary dudes on OR don't hold a candle to you, Burt. Melody - I'm pretty sure that show's as fake as wrestling. That's probably why I like it so much. wow look at that sub 7! April - are you talking about your weather or my mile time? LOL it is in the 20's here! I was complimenting your mile time! my baby plays with javelinas all of the time. Oh my gosh Merri. I got this email yesterday about bad parenting. There were a bunch of pictures. The first one was a baby chewing on a boa constricter. If most of the other ones weren't semi-pornographic, I would forward it to you. There are twenty comments and not one person has discussed whether it was wise to stop and see what kind of criminal was lurking in the shadows. Did you think it could have been some robber the cops were out looking for? and you thought you found them and you stopped to get a better look? I would have thought someone would either have called you very brave or very insane. In everyone's defense, they all (except mother of the year Merri) commented after I posted about my evening run. But, yes, I was trying to be a hero. I figure I've watched enough MMA on TV to take down a criminal. what in the world is MMA? have you been using the vocabulary builder? ?